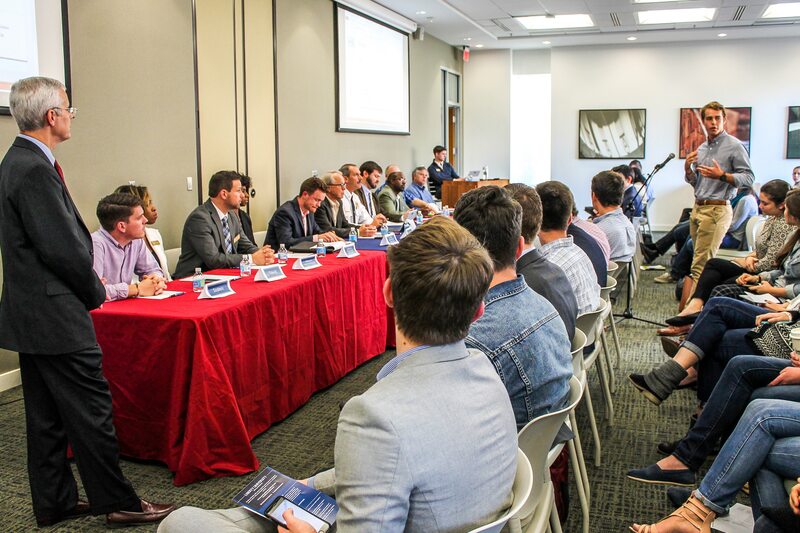 Students’ questions and concerns about Liberty University were addressed by various department representatives at the Dean of Students Town Hall Meeting held in the Jerry Falwell Library Oct. 25. Roughly 50 students attended the event, as well as 11 departments, including representatives from Sodexo, Student Affairs, the Registrar’s Office and Commuter Student Life. Dean of Students Robert Mullen hosted the event. “That’s what we’re here for, to serve the students, and if they have questions, then it’s our job to get answers,” Mullen said. Caleb Fitzpatrick, speaker of the house for the Student Government Association (SGA), submitted questions he had heard repeatedly from students, including adding to-go boxes in the Reber-Thomas Dining Hall, bringing back double meal swipes, making curfew later on weekends and wearing shorts to classes. Concerning to-go boxes, a major concern has been food safety, according to Ryan Wheeler, Sodexo’s marketing manager. No final decision has been made yet, he said. “I know it’s on the table right now,” Wheeler said. Wheeler also said double meal swipes had been a bug in the system that Sodexo allowed to continue. Students were actually losing money on the system and they would often use up their meal swipes too quickly. “Double swipes will never come back,” Wheeler said. A change to curfew and wearing shorts to class were discussed as well. Freshman Class Vice President Gage Taylor also addressed dancing prohibited by the Liberty Way. No substantive changes have been discussed about this matter. Questions on behalf of commuter students were also featured heavily in the meeting. Students asked about a location where commuters could watch a live-stream of Convocation. Mullen said the spirit of the school is for commuter students to participate with residential students, but he recognized the request. “We’re going to look into other options of location where commuters can come together to do that and create a little bit of commuter community,” Mullen said. Also regarding Convocation, Megan Gentleman, an SGA senator representing the school of divinity, requested considering inviting speakers who are not famous to Convocation. “As grateful as I am to hear from such well-known public figures, I have to wonder what kind of a message we are trying to preach to our student body about what it means to be a champion for Christ,” Gentleman said. She suggested that a pastor of a small church might have wisdom to share. Hine said he hoped students’ definition of success was not purely defined by Convocation. He said during his time as a student, students and faculty had a great impact on his life. Hine also pointed out that not all potential speakers would be able to speak before such a large audience. Other student concerns included additional buses for aviation students trying to make it to classes on time, lowered housing prices on the South Campus Quads, 15-minute parking spots in front of Residential Commons II to relieve congestion, and videos displayed around campus about the class officers who represent students. The panel said these questions would be looked at further. Last year’s town hall meeting resulted in some visible changes to this year’s campus. Convocation security checks, the current dining plan, off-campus freshmen parking, an area for commuter students at Green Hall, and the Montview Student Center all were prompted by student questions, according to SGA President Jack Heaphy. Sydney Blackman, a student who helped set up and tear down for the event, said she had originally thought students might come to the event to complain. “It actually turned out a lot more positive than I thought because all the students were really respectful in what they had to say, and they had good reasons for what they asked,” Blackman said. Students might feel that they are bothering staff with their questions, but Blackman said the panel seemed very interested. “My biggest takeaway is probably that the panel actually does care about what we have to say,” Blackman said. Nate Nickerson, a student who asked about initiating a homeless ministry in Lynchburg, said he came to voice his concern and passion. No transit services representatives came to the meeting, perhaps due to a mix-up, Mullen said. He said the Dean of Students Office will forward questions to the various departments who can answer them. “The nice thing about it all is we really do take seriously the fact that, if it can’t be answered here, that we’re recording them, we’re following up and getting students the answers to their questions,” Mullen said. Mullen said this was the best town hall meeting he had been to. Raffle prizes at the meeting included T-shirts, beanies, water bottles and coffee from Bean Tree Café. At the end of the raffle, Mullen hurled remaining water bottles into the audience. Mullen said that sometimes it only takes one person’s good idea to prompt a change on campus. Mullen said the Dean of Students Office is open any time to suggestions, questions and feedback. Students may contact the Dean of Students office at deanofstudents@liberty.edu. Pors is a news reporter.